From Walker Valley High School, front row from left, Alan Bivens, WVHS Mechatronics Instructor; Zachary Holder; Conner Fay; Kynlei Sims, and Dr. Tim Wilson, CSCC Advanced Technologies Department chair. Back row from left, Thomas Mielke, Corbett Sands, Jacob Buckner and Hunter Godfrey. 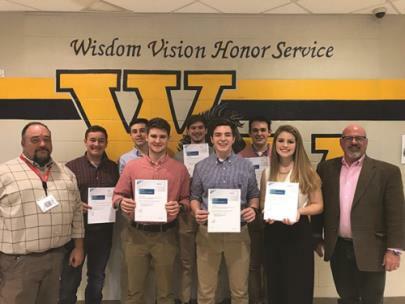 Cleveland State Community College held a ceremony for students from Bradley Central and Walker Valley High Schools who successfully passed the Siemens Mechatronics Systems Certification Program Level 1 certification. Students take the first four of 10 mechatronics courses in the first semester to be prepared for the Level 1 certification. Cleveland State’s Advanced Technologies department is a partner school with the SMSCP, a globally recognized technology leader in mechatronic engineering. Mechatronics is a blend of mechanical, electrical and computerized technologies forming a complex system. CSCC offers an Associate of Applied Science degree in advanced integrated industrial technology, or mechatronics. The training is a blend of precision engineering, control theory, computer science, mathematics and sensory technology. Mechatronics engineers and technicians work in most advanced manufacturing industries and fields. This certification was made possible through the MechaCON Grant. 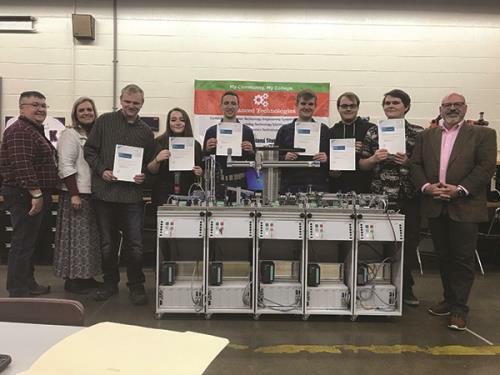 Cleveland State Community College was one of four Tennessee community colleges that received a $250,000 state grant to expand its Middle College Mechatronics Program. The grant was funded by a $1 million appropriation in the 2018-2019 state budget proposed by Governor Bill Haslam and approved by the Tennessee General Assembly. Because high school students don’t qualify for college scholarship assistance like Tennessee Promise and Hope Scholarships until they earn their high school diplomas, most of the grants will pay the costs of tuition, fees, textbooks and materials for the students who enroll in the colleges’ Middle College Mechatronics programs. The Mechatronics courses required in the Cleveland State Mechatronics Level I Certificate and Mechatronics Technology A.A.S. are taught by Siemens Mechatronics System certification Program Level I and II instructors. Cleveland State has invested in training two Level 1 and two Level 2 instructors allowing the college to be a SMSCP partner school. This allows Cleveland State to partner with high schools to provide instruction, instructor oversight and certification training. CSCC is one of few community colleges who are partners with the Siemens Mechatronics Systems Certification Program whereas CSCC can offer globally-recognized certifications on top of academic certificates and degrees. Students can receive both Level 1 and 2 training at CSCC and then transfer to Middle Tennessee State University or the University of Tennessee at Chattanooga to receive their Level 3 training by earning their bachelor’s degrees. Along with this program, the Mechatronics Honors Institute brings further opportunities for students. Implemented this past year, the MHI blends classroom instruction with on-site manufacturing experience at various industry partner sites. Classes such as Electrical Components, Mechanical Components & Electric Motors, Electro-Pneumatic & Hydraulic Control, and Digital Fundamentals and PLCs are offered, among numerous other courses geared toward a career in the manufacturing industry. Upon completion of the program, graduates will earn an Associate of Applied Science degree in Mechatronics Technology. According to Dr. Wilson, CSCC’s advanced technologies program has experienced an 87 percent growth which he credits to strong programs, state of the art hands-on equipment and stellar faculty. Dr. Wilson added that McMinn Central, Polk and Cleveland High Schools will be taking their Level 1 SMSCP exams the end of the spring semester. For more information on CSCC’s advanced technologies department, contact Dr. Wilson at 473-2247 or email him at twilson03@clevelandstatecc.edu.